Over the last decade, more than 50 cities and counties have partnered with the Government Alliance on Race and Equity to advance racial equity and opportunities for all. Together, these agencies have established a solid field of practice that aims to transform government, strengthen community partnerships and eliminate racial disparities. From Seattle to Saint Paul, library departments have been at the forefront of local and regional initiatives to proactively change the policies, practices and systems that create barriers to prosperity and well-being for people of color. 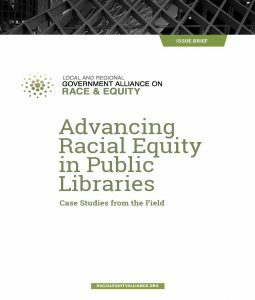 This Issue Brief profiles a handful of public libraries that are leveraging the power and influence of their institutions to advance racial equity in library work and beyond. These libraries are using a shared framework and toolset while developing innovative local approaches to reduce race-based disparities. In doing so, they are beginning to see positive transformations in collections, partnerships, the library workforce, programming, and — ultimately — communities. By sharing the experience of these library leaders, we hope more libraries — working in coordination with local partners and across the field — will adopt and expand the GARE framework for institutional change. If the vision of racial equity “is just and fair inclusion into a society in which all, including all racial and ethnic groups, can participate, prosper and reach their full potential,” then we hope this Issue Brief will be a road map for greater opportunity, participation, and prosperity.